Soon after the attack, journalists who were on the scene disseminated pictures and accounts of the brutality to a stunned nation. ABC TV even interrupted its evening movie with a special news bulletin that included fifteen minutes of video footage from the assault in Selma. The following day, the front pages of newspapers were filled with images and stories of the violence against those petitioning for equal voting rights. The confrontation, made especially salient by its vivid visual depiction, became a symbol of Southern efforts to maintain white supremacy at all costs. Writers called the day “Bloody Sunday,” and the bloodshed made many Americans feel shame and disgrace. Overwhelming numbers of citizens expressed shock that such an outrage could happen in the United States: The violence stirred the nation’s conscience and made a deeper impression than perhaps any demonstration during the civil rights movement. — From “LBJ, ‘We Shall Overcome’“, an essay by historian Garth E. Pauley at Calvin College. 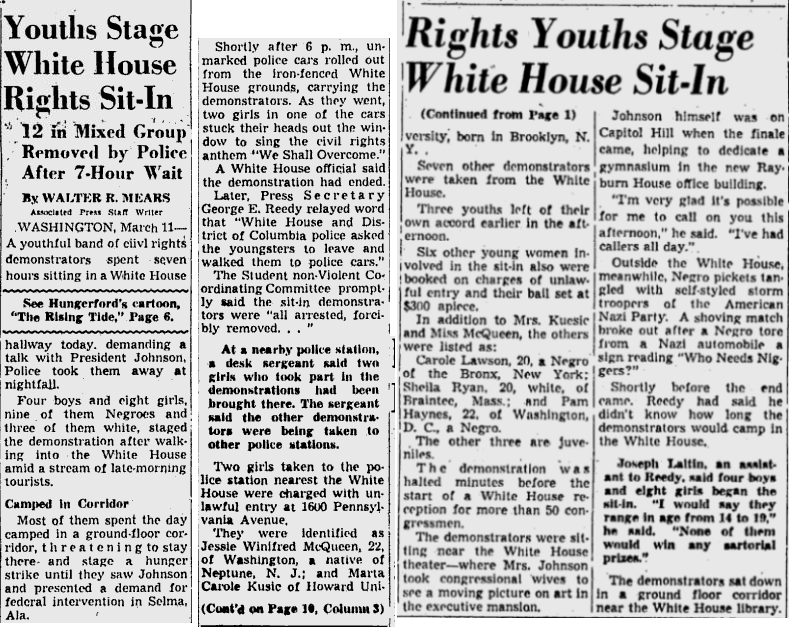 In the furor that followed, civil rights advocates called for President Johnson to take action to protect the marchers from the police. 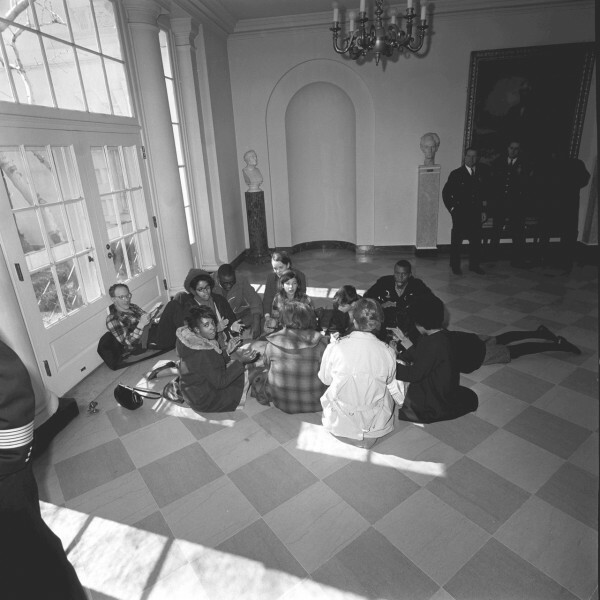 On Thursday, March 11, Sheila participated in the first ever sit-in at the White House, going on the official tour with eleven other youngsters, then sitting down when they reached the East Hall and signing “We Shall Not Be Moved”. The protestors said they would not leave until they had a chance to speak with the President about Selma. The administration was initially uncertain how to respond, but after seven hours, the remaining protestors were arrested and dragged out by police. 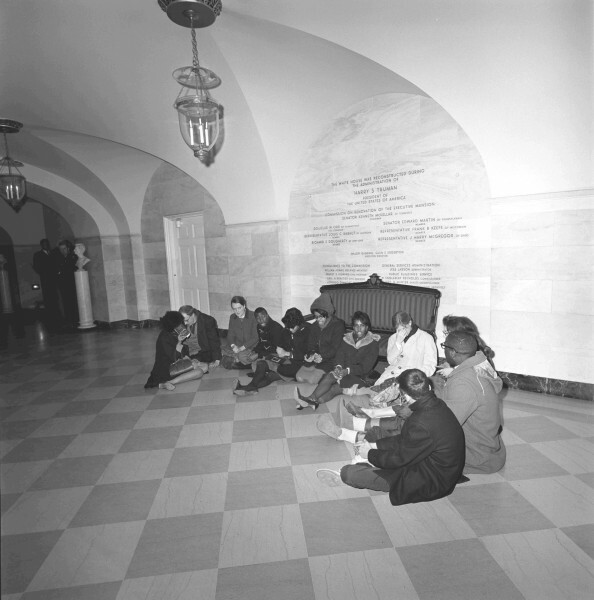 The plan for the sit in was formulated in the afternoon or evening of the previous day, March 10. 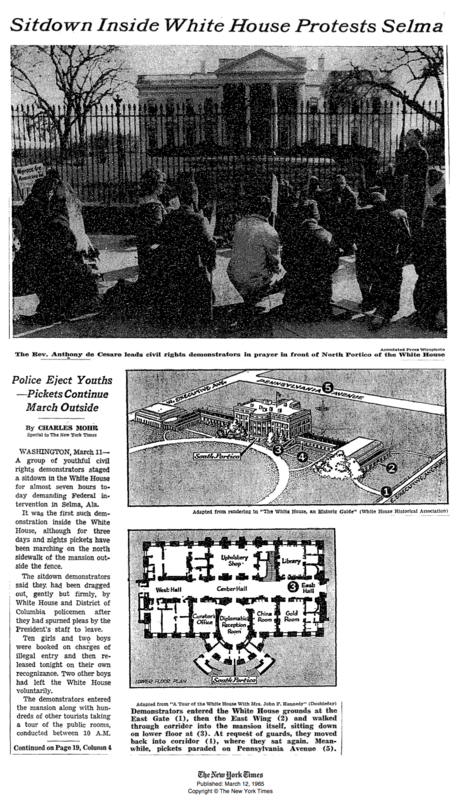 On the morning of March 11, the protestors met that morning at the Fellowship Hall of St. John’s church, located a block away from the White House. They then walked to the tourist entrance and entered separately. They had not previously gone on the tour or selected a spot to sit. They went most of the way through the tour and then spontaneously chose a location to sit down. You can view this area of the White House in Google Maps, which also hosts a panoramic walk-through of the Center Hall and the East Garden Room, which have not changed much in the intervening 48 years. There were twelve protestors in the initial group that sat down in the White House around 11:15. Two of them left during the course of the afternoon, while the remaining ten were removed by the police around 6:15. The names of the seven arrested protestors charged as adults were released to the press, while three minors were not named in police reports. Carol Lawson, 20, female, Black, from the Bronx, NY. (Carol had worked on a literacy project in Selma in 1964, and was one of four SNCC members beaten at a Selma drive-in on July 4, 1964. She later married and changed her name to Carol Lawson-Green. Her life served as inspiration for “Night Catches Us“, a movie about former members of the the Black Power movement. Two other teenage girls whose names we have not been able to learn, one white and one black, both under 18, one of whom may have not been charged. Barry Wells, 14, male, White. Younger brother of Lynn Wells. Seen in this photograph outside the White House shortly before the others remaining inside were arrested. Eugene Harrison (known as “Rick”), male, Black, Washington DC. Identified at the time as affiliated with Howard University, but the Wells report he was still in High School. Spoke briefly outside the protest, said he’d been part of the original group. A teenager who identified himself as “Chico” was photographed outside the White House and claimed to have been part of the protest group but does not appear in the photograph from inside the White House and was not recognized by the either of the Wells. Your Government, at my direction, asked the Federal court in Alabama to order the law officials of Alabama not to interfere with American citizens who are peacefully demonstrating for their constitutional rights. — From March 13 speech by President Johnson, archived at the LBJ Presidential Library. 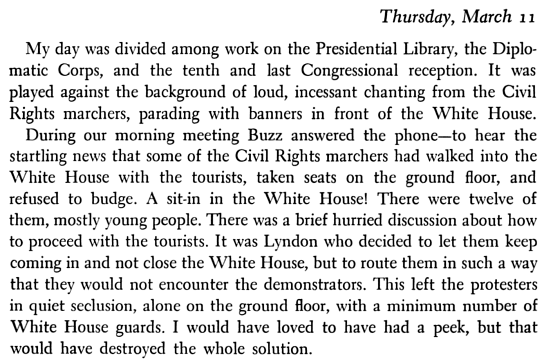 The president was aware of the presence of the Lafayette Park protestors and especially those who staged a sit-in on the floor of the White House. As he introduced his proposed voting rights act to Congress on March 15, 1965, he praised the protestors from across the nation, thousands of whom were not far from his doorstep at the time. — From “Citizen’s Soapbox, A History of Protest in Presidents Park“, at WhiteHouseHistory.org, operated by The White House Historical Association. 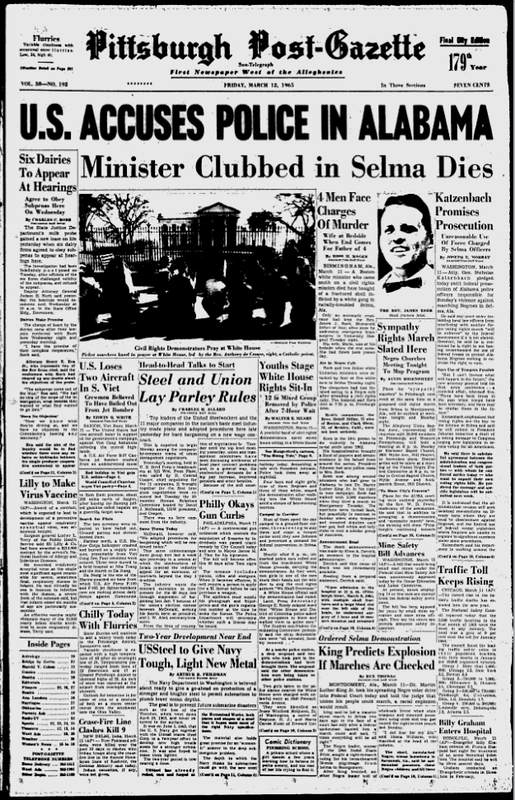 Two weeks later, with the protection of a federal court order and the federalized Alabama National Guard, the voting-rights protestors were able to proceed with their march from Selma to Montgomery. 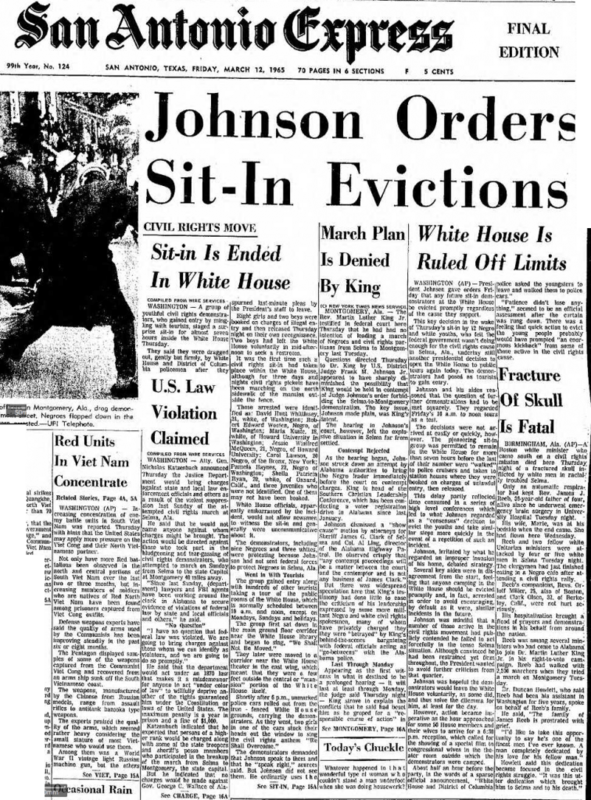 However, while facilitating the protests in Selma, Johnson wanted to rule out changes of further sit-ins at the White House. We must preserve the right of free speech and the right of free assembly. But the right of free speech does not carry with it–as has been said–the right to holler fire in a crowded theatre. We must preserve the right to free assembly. But free assembly does not carry with it the right to block public thoroughfares to traffic. We do have a right to protest. And a right to march under conditions that do not infringe the Constitutional rights of our neighbors. And I intend to protect all those rights as long as I am permitted to serve in this office. — From the “We Shall Overcome” speech by President Johnson before Congress, March 15, 1965. Over the course of the next year, the case of the seven protestors was appealed, but the appeal was denied. 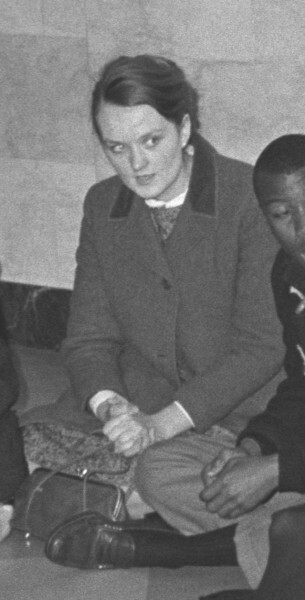 Sheila entered the Women’s House of Detention in the summer of 1967 and remained there until early 1968, where she was an uncooperative prisoner. This entry was posted in Civil Rights on March 11, 1965 by Matthew. Second Update: Another area of the LBJ Library’s web site has these in higher resolution, and adds a third photo, taken before the other two, while they were still sitting in the Center Hall outside of the library. There must be more photographs from this sequence in their archive. 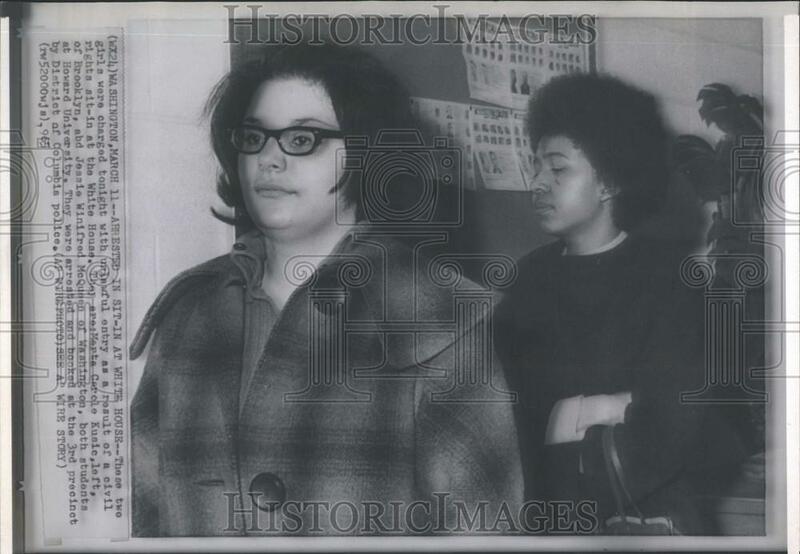 This entry was posted in Civil Rights, Photos on March 11, 1965 by Matthew. The LBJ Presidential Library has released copies of the official White House diary kept during the Johnson administration. 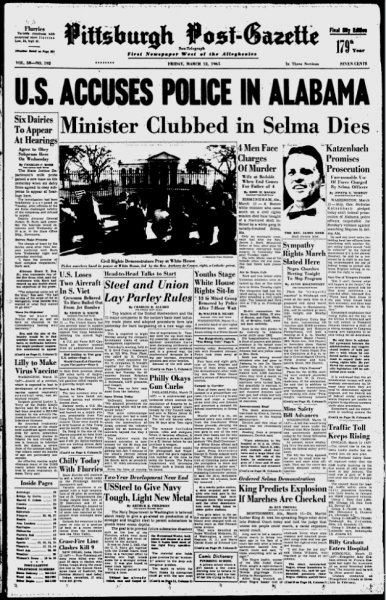 The entry for March 11, 1965 contains multiple entries regarding the sit-in, many of which feature Rufus Youngblood, a US Secret Service agent who had leapt to protect Johnson during the assassination of JFK, and was put in charge of the White House Secret Service detail when Johnson became President. The log also notes the involvement of Presidential advisors Bill Moyers, Jack Valenti, Cliff Alexander, and Lee White in the discussions that day. 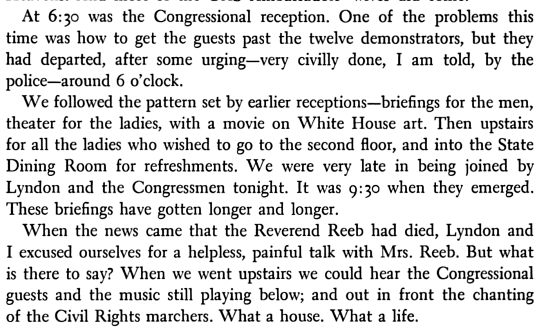 11:20 Rufus Youngblood, USSS, went to the second floor to see the President. 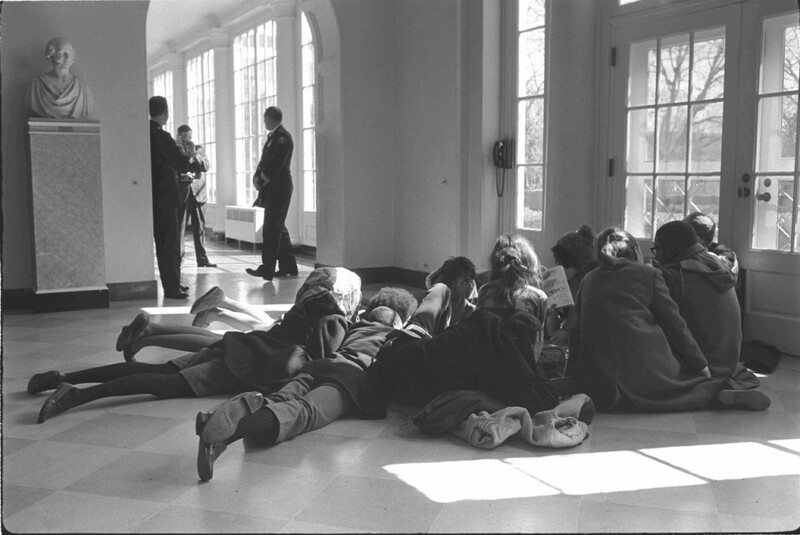 He was on the telephone, so he sent a note into the President by way of Ken Gaddis to the effect that 12 demonstrators were sitting down on the ground floor. This entry was posted in Civil Rights, Press Clippings on March 11, 1965 by Matthew. This entry was posted in Civil Rights, Press Clippings on March 12, 1965 by Matthew. 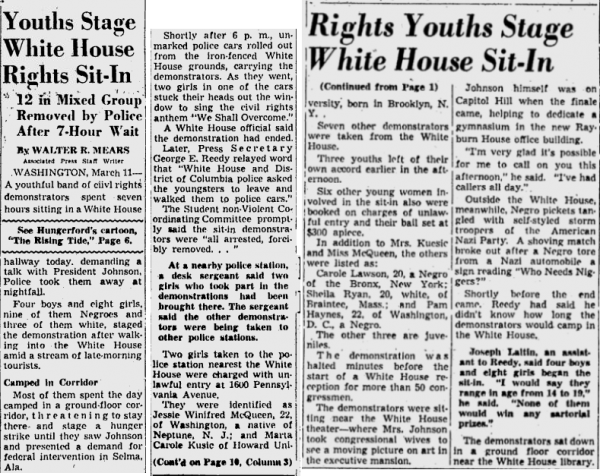 — From “White House Seiged by Sit-In“, the Charleston Gazette, Friday March 12, 1965, Front page and page 27. 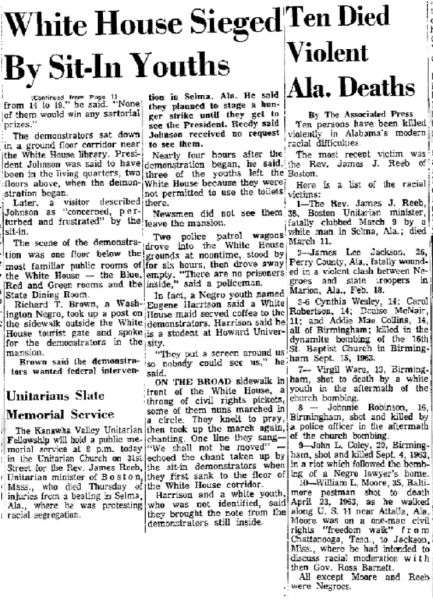 — From the Press Telegram, Friday, March 12, 1965, page 2. 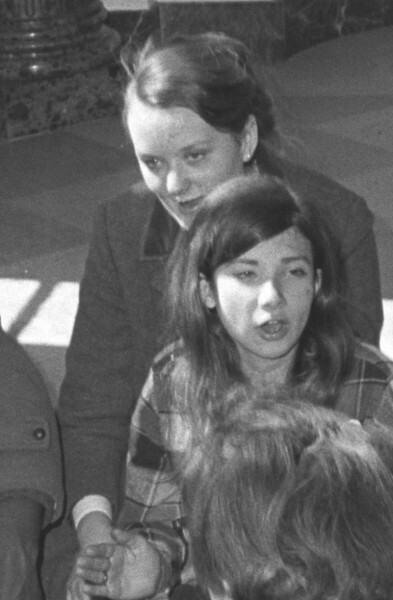 This photo from the Boston Globe on March 12, 1965 shows Sheila and two other women talking with their lawyer following their arrest at the White House. 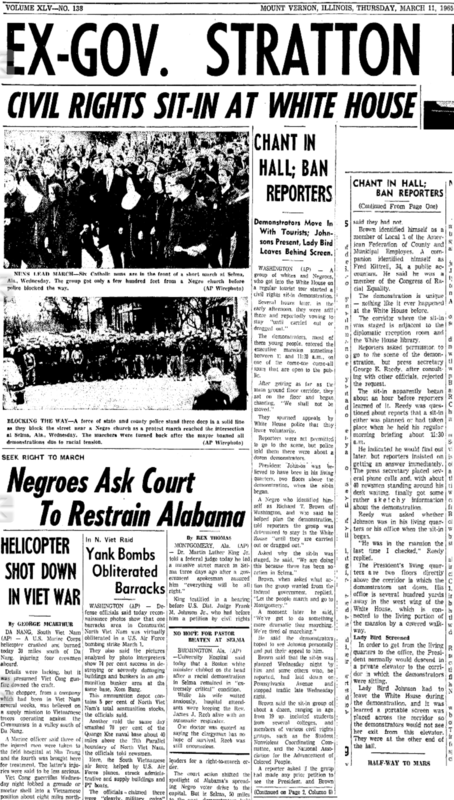 The Boston Globe reported on Sheila’s protest and arrest on March 12, 1965. From the San Antonio Express, Friday, March 12, 1965, Page 1A and 16A.